A memorial to the citizens of Lidice, Czechoslovakia, massacred by the Nazi Gestapo in 1942. It is one of only two such memorials to Lidice in the United States. The Lidice Memorial in Sokol Park, Phillips, Wisconsin, is a monument built during the summer of 1944 and dedicated on August 27, 1944. It was dedicated to liberty, humanity and justice to all people of the world in remembrance of a small Bohemian village in what was then known as Czechoslovakia. The monument stands on the corner of Fifield and Ash Streets in Sokol Park, off of Highway 13 north. Many immigrants of Slavic origin came to America during the time of Austro-Hungarian rule. They came seeking better lives free from serfdom, strict military conscription laws, and to find religious freedom. After the fall of the empire in 1918, Czechoslovakia became a country and Czechs, Moravians and Slovaks continued to emigrate from the homeland. Many of the men found work in coal mines and steel mills in the eastern part of the USA. The women often became domestics, ran boarding houses or found factory work. Families that eventually settled in Price County, purchased cheap, cut-over, timber land and through their hard labor, made it suitable for farming. Some worked in logging camps to supplement their incomes and some set up small businesses or trade shops within the city or in the near-by lumber town of Lugerville, and other areas of Price County. The Czech/Slovak community in the Phillips area was close-knit and together they built schools and churches. They were able to purchase a former school building for Sokol (gymnastic) activities and the Zapadni Ceska Bratrska Jednota meetings. The Z.C.B.J. was a fraternal association of Czech Americans, founded in 1897, that also provided life insurance to its members. (The name translates into English as the "Western Bohemian Fraternal Association" and was later opened to other nationalities. It is known today as Western Fraternal Life Association.) Social events included dances, card parties, theatre productions and through these contacts they offered one another assistance and support. In the late 1930s, Nazi Germany began to overrun Europe and Czechoslovakia was not spared. Adolph Hitler assigned SS-Obergruppenführer Reinhard Heydrich as the Protector of Bohemia and Moravia. A ruthless, bloodthirsty killer, he was the principle author of the “Final Solution to the Jewish Question,” and was deeply enmeshed in planning the Holocaust: the plan to eradicate the entire Jewish population in Europe and part of Russia. Hitler assigned Heydrich to break the back of the resistance movement and immediately upon his arrival in Prague, mass murders became common place. His activities and notoriety made him the target of a highly secret mission planned by the Czechoslovak Army in exile, based in London, England. “Operation Anthropoid” was considered a success when Heydrich died as the result of wounds sustained in the assassination attempt, 9 days after the plan was executed. The assassination of SS-Obergruppenführer Reinhard Heydrich was the most significant event in Czechoslovak World War II history. This man was much feared in all of Europe, even within his own Nazi Party. In retaliation for the assassination, while seeking those who may have helped with the plot, Lidice was targeted when misinformation led the Gestapo to the village with little regard that the citizens were innocent of any connection to the assassination. By direct order of the Führer, the village was surrounded late night, June 9, 1942. The next day, all men in the village 16 and over, were shot dead; Men not in the village at the time, were killed later. No one escaped. The women and children were separated and women were sent to concentration camps. Eighty-two of the 105 Lidice children were gassed in July, at Chelmno, Poland. Six children died by other means, and 17 were spared due to having Aryan features, deeming them fit for Germanization. The village was burned, dynamited and bulldozed to oblivion. The cemetery was desecrated, with some 400 graves dug up and mutilated. When the Nazis were finished, only a bare plain remained. The village was erased from German maps and even the small river running through the village was diverted. Some of the 17 surviving children were adopted, some were still in orphanages, but at the war’s end the 17 were found and brought back to remnants of family. Of 203 Lidice women over age 16, 143 returned. Sixty of the women and 192 men died. The Czech/Slovak community in Price County was stunned by the news. They felt a special kinship to the small village as they shared common surnames and some had friends there. A memorial was designed by Vaclav Hajny, a Czech immigrant and commercial artist whose father once lived in the village. 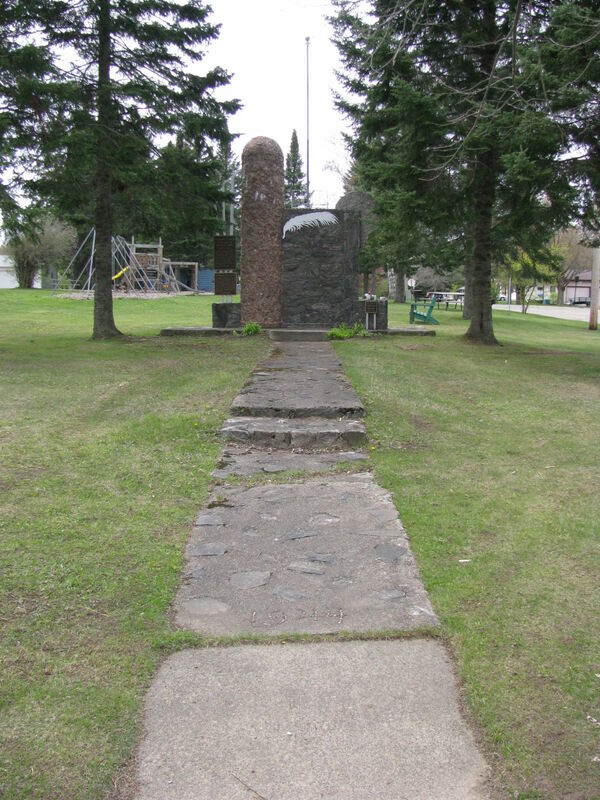 Hajny designed a small, temporary monument and a memorial service was held in June, 1943. His larger design included the name LIDICE forged in iron by a local blacksmith, placed at the top of the monument, and three rods in graduated sizes portraying the Czechs, Moravians, and Slovaks leaning into the United Nations (the red granite pillar) for support. The evergreen spray on the face of the monument symbolized everlasting life for the victims and the rising sun to the right symbolized hope that Lidice would rise again. A mason, Karel Novy, sculpted the monument and additional manpower came from members of the Sokol and Z.C.B.J. Each year, for many years, a memorial service was held at the monument site until the old immigrant faction diminished. The property was deeded to the City of Phillips by the CzechoSlovak Hall Association in 1974. In 1984, there was a renewal of the memorial service, and the Phillips Czechoslovakian Community Festival was founded. Currently, memorial services serve as a prelude to the festival weekend, each third full weekend in June. The intention of Hitler's infamous order was to bury Lidice forever. Rather, the atrocity made the small Bohemian village immortal. Editor's Note: Toni Brendel is an author with a personal connection to the history of Lidice. Her essay was based on interviews with two surviving Lidice "children" during a visit to the memorial site in 2011. She also wishes to acknowledge the staff at the Lidice Memorial in the Czech Republic, and the use of resource books that were gifted to her by them. Eduard Stehlik's LIDICE: The Story of a Czech Village and his most recent work, Memories of Lidice, are invaluable resources. Major Eduard Stehlik, PhD is a military career man who researched central and regional archives and libraries to bring the most accurate information recorded to the public. His work is gratefully acknowledged by Ms. Brendel. Czech-Slovak Festival - The official website of the Czech-Slovak Festival held in Phillips, Wisconsin each year, with memorials to Lidice. Toni Brendel's Bookstore - Toni Brendel is a passionate historian of Lidice and advocate of the Czech/Slovak community. Her contributions to this page are greatly appreciated. If there is such a list, you would likely find it in the Czech Republic. I do not have any contacts, there are several Facebook pages for Lidice, including one by Toni Brendel who did comprehensive work on preserving the memory. One of the Facebook groups provides this link that you start with. I would like to pose a query regarding the victims killed in the Lidice Massacre. Is there a comprehensive list of names by chance? Please assist. Thank you. Dear Sir I can confirm that Mr. Chabala did not live in Lidice, I have been researching the story of the village for the past 16 years. I have been to Lidice many times and have met many of the survivors that still live in the village. Each year I get a personal invite to attend the memorial in Lidice. I have withdrawn my essay and replaced it with an essay written by Toni Brendel. There's also a new photograph of the Lidice Memorial, taken by Bill Ball last month, that shows the restored memorial. Many thanks for Toni and Bill for their contributions and help in not only improving this listing, but also for telling the story of Lidice. I don't mean to be unkind, but this version of the Lidice tragedy is riddled with inaccuracies. Mr. Manning, will you please contact me? Thank you. Author, "Lidice Remembered Around the World"